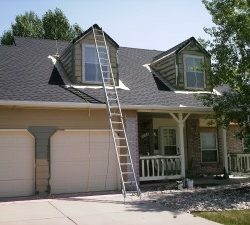 Distinct Painting Company has been serving the Fort Collins, Loveland, and Windsor areas of Northern Colorado since 2007. Since then we’ve been building a reputation for high-quality painting work paired with customer service known for its courteous manner and a high level of integrity. 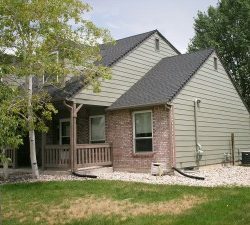 We understand that Colorado has extreme temperatures which are constantly fluctuating throughout the year. The average cold temperatures in this area in December is 15 degrees. Northern Colorado can see blizzards that will try to blow the paint off your house. 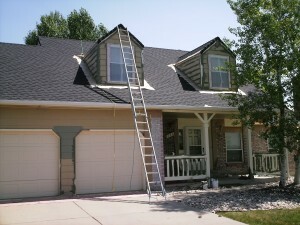 Summer temperatures can easily reach into the 90’s with arid conditions that will try to dry the paint off your house. For these reasons, we use only the finest exterior paint primers and finishes formulated specifically for our climate and region. In the prep phase of the project, the entire house is inspected thoroughly. Any and all old paint is removed and the area sanded. We then will prime the house. Priming makes the overcoat of paint adhere fully. We will then caulk any areas that need sealing. For caulking, we use only the Best Poly-Urethane Sealants on the market. We know that every step has to be done with attention to detail and commitment to the highest level of craftsmanship. 100% Superior Craftsmanship every time is our goal. Whether we are painting inside our out, we strive to work in a clean, courteous and respectful manner. We know that your house is a major investment and having quality, cold and heat resistant paints plays a role in protecting your investment. We offer an 8-year warranty on all our work. This warranty covers paint failure such as bubbles, flaking, and peeling. 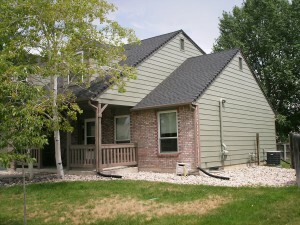 The exterior of your house included decks and wood finishing that we can paint or finish as well. Leaving the wood unfinished will significantly shorten the life of the wood. Staining exterior wood will show off the wood’s natural beauty of the grain and color. Painting exterior wood cuts down on maintenance but once painted, you can’t go back to a natural wood look. Paint protects wood from the harsh elements of Northern Colorado. We are a full-service painting company, painting and staining any wood trim on your house. We fully prepare all exterior wood for staining or painting. We will sand and repair with wood filler any weak spots in your wood. A fresh coat of exterior paint is one of the most cost-efficient ways of increasing your home’s curb appeal. Curb appeal is a key point in selling your home. The colors you choose can hide the flaws or accent the positive of a house. The colors you choose can send a message about you and the house and should suit the architectural style of the house and the neighborhood. Our high standards extend beyond our painting work. We recycle everything we can and responsibly dispose of all materials that can’t be recycled. When you choose Distinct Painting Co., you are choosing professionals who adhere to the highest standards of work quality, ethics, and respect for you and your home.